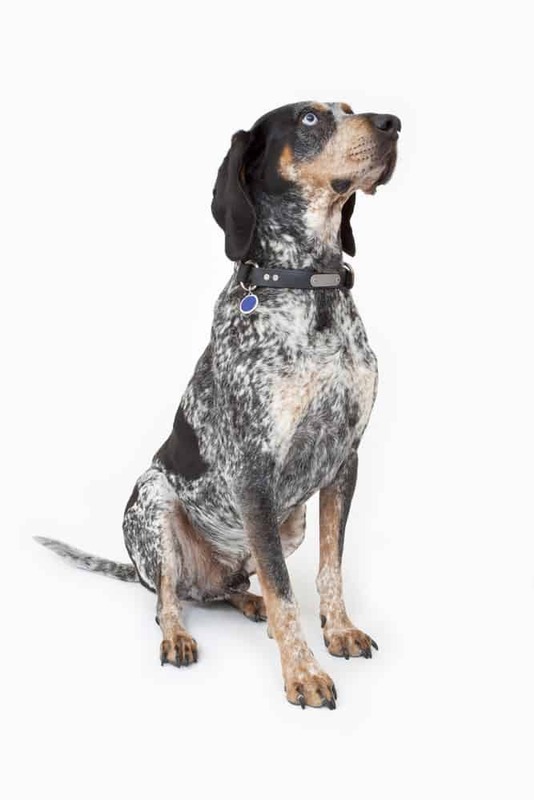 Unmistakable with their striking coat, the Bluetick Coonhound temperament is goofy and playful. Bluetick Coonhounds are of noble descent. Their ancestors are of the “French Grand Bleu de Gascogne” and English Foxhound. Both breeds were brought to the United States during colonial times. The Bluetick Coonhound dog is a scent-hound and was bred to have high endurance and a “cold nose” – referring to a dog who is able to work scent trails up to days old. Earlier Blueticks were used to hunt raccoons but often worked in packs to hunt bear, wild boar, cougars, and lynx. 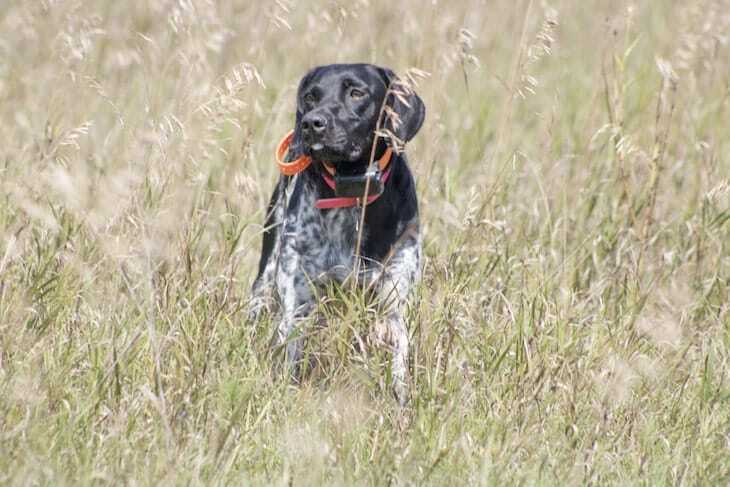 Today, Bluetick Coonhounds are still hunters, but they are also great family companions. Bluetick Coonhounds have silly personalities that will win you over. This is a breed that absolutely adores their family and becomes strongly attached to their humans. Though they are of hunting descent, Bluetick Coonhound pups double as great house dogs. They do have a strong prey drive, though, so Blueticks need supervision when small animals are near. Always keep your Bluetick on a leash or in a secure yard. Bluetick Coonhounds are tough. They can hunt in any weather at any time of the day. They also have a howl – or bay – that is completely unique to each Bluetick Coonhound. This good-looking breed is sensitive and loving, making them an overall friendly and happy dog. They tend to get along with children but be careful with toddlers. Because they are high energy, they may be too rambunctious for smaller children. Blueticks also get along great with other dogs – and cats – when raised together. Bluetick Coonhounds can adapt well to most living situations. They do well both indoors and outdoors – though they much prefer indoors! Especially if it includes a soft bed or a comfortable couch. This breed doesn’t like to be left alone for long periods of time. Blueticks thrive on companionship and do not well without their humans’ love and affection. On the flip side, Blueticks can be stubborn and loud. They are well known for the “big bawl mouth” which is not always ideal in an apartment building! For their (minor) drawbacks, Blueticks are generally a lively, fun, loyal breed with a goofy side. Begin training your Bluetick Coonhound puppy early. Their stubbornness can be a challenge, but consistency will help. Only use positive reinforcement with Blueticks. This a sensitive breed that will not respond to harsh or negative training methods. Blueticks will love training if it involves lots of treats and praise as a positive reinforcement. Early socialization will help Bluetick Coonhound puppies grow into well-mannered and well-adjusted adults. If you are not planning on using your Bluetick for hunting, consider enrolling them in search and rescue or obedience training. This a breed that loves to have a job and will excel in any advanced training you throw at them! Between their striking coat and fun personality, it’s no surprise you would want to add a Bluetick Coonhound to your family. But, do you want to purchase a Bluetick from a breeder? Or, adopt from a rescue organization? Breeders offer purebred Blueticks while rescues have a mix of purebreds and mixes. A Bluetick Coonhound price is between $500-$600 but can go up to $800-$900 depending on the lineage. The price of Blueticks depends on the demand, location, availability of litters, and lineage. American Kennel Club (AKC) registered Bluetick Coonhound puppies for sale will be more expensive than non-AKC registered puppies. If you are not looking for a Bluetick Coonhound for sale through a breeder, why not consider adoption? Because this breed is not for everyone, Blueticks may find themselves in shelters. To find a Bluetick Coonhound rescue, the American Kennel Club has a resource for rescues dedicated to Blueticks. Adopting a Bluetick Coonhound is a great option for those who are looking for an adult dog or even a Bluetick mix. Both sites provide information on the breed as well as resources for finding a Bluetick breeder. Bluetick Coonhound breeders should be knowledgeable about the breed and provide proper health certificates. Steer clear of any breeders that are unable to provide any health certificates as you could find yourself with a sick Bluetick puppy! Breeders should also be more than willing and able to answer any question you have about Blueticks. And, they should ask you questions as well to get to know you, your family, and your lifestyle. The average Bluetick Coonhound lifespan is between 11-12 years. The average Bluetick Coonhound size is between 22-27 inches and 55-80 pounds for males and 21-25 inches and 45-65 pounds for females. Thanks to their short coat, grooming a Bluetick Coonhound is fairly easy. They have a glossy, smooth, dark blue coat that is covered with black spots on the ears, back, and side. Their heads and ears are almost all black with tan markings around the eyes and cheeks. Unmistakable coat aside, these dogs do need grooming. Blueticks require weekly brushing with a brush or rubber grooming mitt that will remove loose and dead hair. This breed is a moderate shedder that only requires the occasional bath – unless you have a mischievous Bluetick that likes to get into things they shouldn’t! A fairly healthy breed, the Bluetick Coonhound is not prone to a lot of health issues. However, they can suffer from Hip Dysplasia, Lysosomal Storage Disease, and Bloat. Be sure to regularly check their low-hanging ears for signs of infection. This hunting dog needs plenty of exercises. Schedule regular playtime and daily walks to get their energy out. Agility or tracking are great outlets for the energetic Bluetick Coonhound. Post-exercise, the Bluetick is perfectly happy snuggling up with you on the couch! The tenacious, smart Bluetick Coonhound may have a hunting history, but they make wonderful family companions. With a stubborn streak and endless energy, Blueticks can be difficult to train but with consistency, they’ll have no problem learning. If you’re looking for strikingly beautiful, devoted dog, the Bluetick Coonhound is for you.